Classifying numbers as rational or irrational. Moving between different representations of rational and irrational numbers. Before the lesson, students attempt the assessment task individually. You then review students’ work and formulate questions that will help them improve their solutions. After a whole-class introduction, students work collaboratively in pairs or threes classifying numbers as rational and irrational, justifying and explaining their decisions to each other. Once complete, they compare and check their work with another group before a whole-class discussion, where they revisit some representations of numbers that could be either rational or irrational and compare their classification decisions. In a follow-up lesson, students work individually on a second assessment task. Each individual student will need a mini-whiteboard, pen, and eraser, and a copy of Is it Rational? and Classifying Rational and Irrational Numbers. Each small group of students will need the Poster Headings, a copy of Rational and Irrational Numbers (1) and (2), a large sheet of poster paper, scrap paper, and a glue stick. 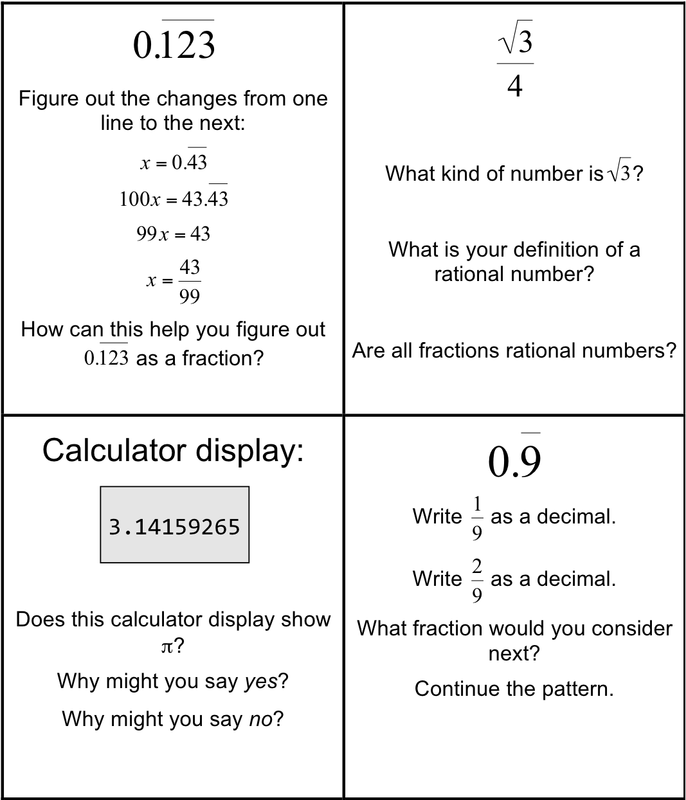 Have calculators and several copies of the Hint Sheet available in case students wish to use them. Either cut the resource sheets Poster Headings, Rational and Irrational Numbers (1) and (2), and Hint Sheet into cards before the lesson, or provide students with scissors to cut-up the cards themselves. You will need some large sticky notes and a marker pen for use in whole-class discussions. 15 minutes before the lesson for the assessment task, a 1-hour lesson, and 20 minutes in a follow-up lesson. All timings are approximate and will depend on the needs of your students. H.N-RN: Use properties of rational and irrational numbers.